Produced by Gagne, this light-table tracing work-station is a sturdy and attractive table with a solid oak trim and an enamel base in white. Gagne TABLE LIGHT BOX size 30"W x 42"L x 39"H LED is a versatile work-station and tool that allows tracing and multiple uses for design, photography and engineering in the office, studio or home. The 36”x 48” surface and 5,000 K lamps provide adequate work surface and lighting for virtually any application. The table surface is of Plexiglas and adjustable from 0 to 40 degrees in 10 degree increments. Note that these units are shipped without glass – if glass is needed detailed instructions are provided to follow when ordering. This stylish unit has a solid oak finish that will fit any décor. Easily movable at a weight of 85 pounds. A quality product manufactured by Gagne, a leading U.S. provider of Artists' Light Boxes and Projectors. 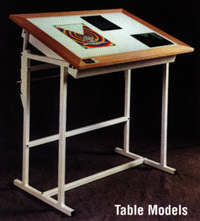 Porta-Trace® 42" x 54" Light Table has a viewing area of 36" x 48". The tilt-angle surface is adjustable and has a Plexiglas work surface illuminated with 5,000 K daylight lamps. Overall surface is 36” x 48”. Unit shipped without glass.